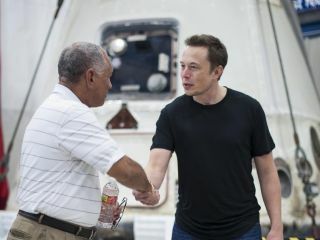 NASA administrator Charles Bolden (left) congratulates SpaceX CEO and chief designer Elon Musk on June 13, 2012. Behind them is the Dragon capsule that on May 25 became the first private vehicle ever to dock with the International Space Station. NASA chief Charlie Bolden got an up-close look Wednesday (June 13) at SpaceX's unmanned Dragon space capsule, the first private vehicle ever to dock with the International Space Station. Bolden viewed the Dragon capsule at SpaceX's Rocket Development Facility in McGregor, Texas, where he joined company CEO and chief designer Elon Musk. The two men thanked the more than 150 SpaceX employees who work at the facility for helping make Dragon's groundbreaking flight possible. "The Dragon capsule is a tangible example of the new era of exploration unfolding right now," Bolden said. "I congratulate Elon Musk and the SpaceX team again for this historic milestone." Dragon is the only robotic cargo craft currently available that can survive the return trip to Earth. Other supply ships burn up in our planet's atmosphere after leaving the station. After splashdown and recovery, the capsule was shipped to McGregor, where SpaceX personnel offloaded the 1,367 pounds (620 kilograms) of gear Dragon brought back down to Earth. Bolden had the chance to view this cargo during his tour as well. Dragon's recent flight was SpaceX's second demonstration mission under NASA's Commercial Orbital Transportation Services Program (COTS), which aims to spur the development of private cargo-carrying craft to fill the void left by the retirement of NASA's space shuttle. The company is also working to develop a crew-carrying version of Dragon, which it hopes will be carrying NASA astronauts to and from the station within three years or so. Musk has said a crewed Dragon could eventually transport astronauts to Mars and other destinations in deep space. The success of SpaceX and other private spaceflight companies is key to NASA's long-range human-spaceflight plans. The space agency has given money to four American firms — SpaceX, Blue Origin, Boeing and Sierra Nevada Corp. — in the hope that at least two of them will have vehicles flying to and from the space station by 2017. Until then, American astronauts will ride aboard Russian Soyuz vehicles, at about $62 million per seat. NASA, meanwhile, is concentrating on developing a deep-space transportation system. In 2010, President Barack Obama directed the space agency to work toward getting astronauts to an asteroid by 2025, then on to the vicinity of Mars by the mid-2030s.